The 4.1-mile $65 million Central Thruway opened to motorists today, providing a direct, Interstate-quality link from Sullivan Road to Florida Boulevard. 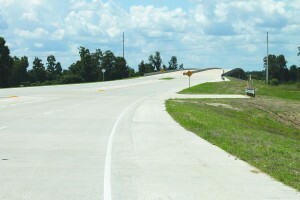 Eventually, the project is supposed to connect to I-12. The highway was originally pushed by former Metro Councilman Joe Greco. According to David Barrow of the City of Central, the Central Thruway will tie into Sullivan 150 feet south of Lovett, and Sullivan Road will be temporarily blocked off. That portion of Sullivan Road south of the Central Thruway will have to be accessed from Greenwell Springs Road.